The #1 Brightening Specialist product in the U.S.* is now available in a travel-friendly size! The ultimate dark spot lightening serum is formulated with 2% hydroquinone, the pigment lightener doctors prescribe most. Murad formulates with the highest level available without a prescription. In as little as 1 week, it visibly fades dark spots, sun spots, age spots and uneven skin tone. Rapid Age Spot and Pigment Lightening Serum combines hydroquinone with Hexapeptide-2, a powerful skin-brightening peptide that helps lighten dark spots and prevent the appearance of future damage for a more even, more radiant skin tone. Exfoliating glycolic acid lifts away dull, dead skin cells and allows active ingredients to penetrate more quickly, so you see spots fade faster and more radiant skin sooner. Results can vary, but most users see lightening results in as little as 7 days. Hydroquinone is the only over-the-counter skin lightener approved by the FDA. For more than 50 years, dermatologists like Dr. Murad have prescribed hydroquinone because of its excellent ability to lighten frustrating dark spots, sun spots and age spots on all skin tones. Even the most potent skin lightening treatments can be counteracted by UV light, a proven dark spot trigger. That’s why Dr. Murad’s skin lightening prescription always includes a daily SPF, such as City Skin Age Defense Broad Spectrum SPF 50 | PA++++. This vitamin C-boosted, color-correcting mineral SPF for all skin types has a luminous finish that flatters all skin tones. PM. After cleansing, massage evenly over clean face, neck and chest. 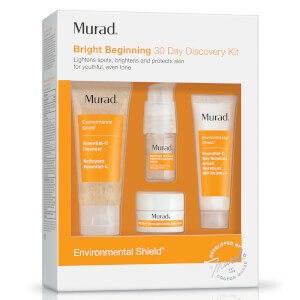 Follow with a Murad moisturizer and sunscreen during the day. Inactive: Water (Aqua), Alcohol Denat., Glycolic Acid, Butylene Glycol, Glycerin, Methyl Gluceth-10, Dextran, Hexapeptide-2, Rice Amino Acids, Aloe Barbadensis Leaf Juice, Urea, Yeast Amino Acids, Trehalose, Inositol, Taurine, Betaine, Zinc Gluconate, Ascorbic Acid, Chitosan, Propyl Gallate, Nonoxynol-10, Lecithin, Tocopherol, Magnesium Ascorbyl Phosphate, Dipotassium Glycyrrhizate, Palmitoyl Hydroxypropyltrimonium Amylopectin/Glycerin Crosspolymer, Vitis Vinifera (Grape) Seed Extract, Chitosan PCA, Allantoin, Polyquaternium-10, Sodium Metabisulfite, Sodium Sulfite, Sodium Hydroxide, PPG-26-Buteth-26, PEG-40 Hydrogenated Castor Oil, Hydroxyethylcellulose, Disodium EDTA, Limonene, Linalool, Fragrance (Parfum).